Like seriously, Free browsing tweak has been scarce now, that's why i am giving an alternatives to you all, atleast for you guys to be online. Don't worry, i am working tirelessly to make sure you guys browse free. Always check back on us cos we might post a tweak anytime soon. Today i am bringing to you another offer from Etisalat which i think you might like. 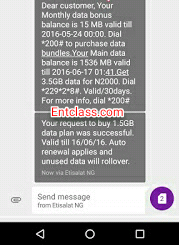 After testing and confirming the Airtel BB10 plan of 3GB for N1000 that works on android and pc, i am here with Etisalat 1.5GB for N1000 that doesn't need you to change your imei like that of Airtel BB10. It doesn't require any special settings or vpn before it can be used. The data is valid for 30days. Etisalat has wide coverage, i think you should consider this. What do you have to say about this data?